For months, Cousin Russ and I have studied how to improve access to Mondays with Myrt, WACKY Wednesday and our wildly popular genealogy study group sessions. We love Google hangouts, but for some people there has been the problem of not wanting to join Google+ and deal with a new social media network. We've come up with a brand new look for our video hangouts and it is finally possible for anyone to VIEW and COMMENT using a Facebook, Twitter, LinkedIn or Google account. You'll only need Google if you plan to be a filmstrip panel participant. Cool! You'll notice Ol' Myrt has moved the site of our hangout activity back to DearMYRTLE's website. Cool! Our new DearMYRTLE hangouts offer a custom registration page for each hangout, with email confirmation that includes a clickable navigation link for the hangout in question. You'll also receive a personalized email reminder 4 days, 1 day and 1 hour before the scheduled hangout. If you click on the link in the email, you can then VIEW and COMMENT before, during and after each hangout. Cool! Once you've registered using your favorite social media account, DearMYRTLE Hangouts confirmation and reminder emails will give you everything you need to know. Here's a short video demonstrating the process. Thanks to your generosity in 2015, we are able to provide this new hangout interface. Cool! We appreciate your support through the Pay What You Want system. Cool! You'll see a notice in DearMYRTLE's Blog, Facebook, Twitter and Google+ about every DearMYRTLE hangout. Cool! We continue to use Google Hangouts, but with the Business Hangouts interface. Cool! You'll still be able to COMMENT, before, during and after each hangout. Cool! You'll still find DearMYRTLE hangouts listed in the GeneaWebinars Calendar. Cool! More people can now VIEW and COMMENT using either Facebook, Twitter, LinkedIn or Google accounts. Cool! To COMMENT, you'll need to click on the link in your registration email. If you were to go to back to hangouts.DearMYRTLE.com you would only be able to VIEW the hangout and comments. Cool! There's a new DearMYRTLE hangouts Calendar here. Cool! 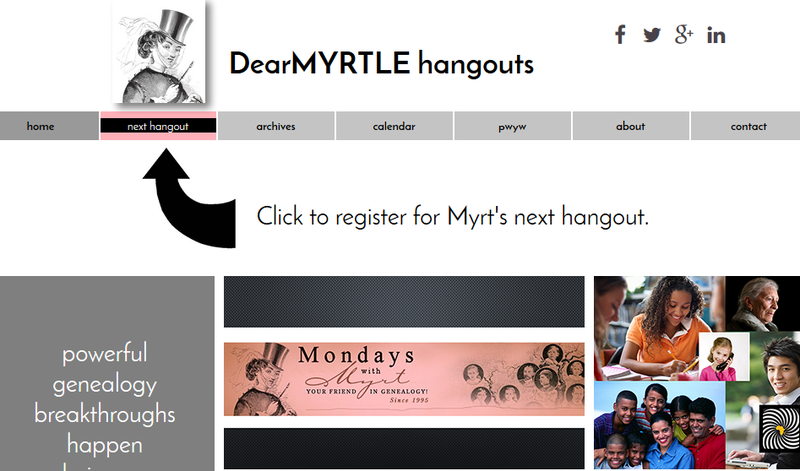 The service Ol' Myrt is using to process our new DearMYRTLE hangouts is Business-Hangouts. Cool! WHAT'S DIFFERENT ABOUT THIS WEEK? Although we have four scheduled DearMYRTLE hangouts this week, we're only putting up one registration option at a time. Next week you'll see links for all four. Cool! You could watch the archived hangouts over on DearMYRTLE's YouTube Channel, but with DearMYRTLE hangouts site, all COMMENTS will be on the right side of each hangout video. Cool! Historically the majority of DearMYRTLE followers are "Watch later" VIEWers. Now you may scroll back through and find all the links we mention. Remember, if you've registered, You'll click through to the exact hangout to COMMENT before, during and after the hangout. Cool!